A MOV is a multimedia format that is used for saving and creating video files. MOV was developed by Apple for their Macintosh systems. 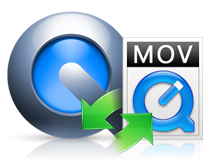 MOV is native to Mac’s QuickTime Movie Player. As a universally accepted multimedia file, it is widely available for online downloads these days too. MOV may contain video, audio, animation, graphics, virtual reality, 3D, and text information. This file format is easily manipulated with the right software installed. MOV files is a very common file format, especially for Macintosh computers. MOV used to be exclusive to Apple devices but later on, almost all platforms are able to play MOV files. Here is a quick overview on how to play MOV files on different devices. However, there are situations that you can play MOV files as you want. Wanna to import MOV files for editing or burning, but your video editor or DVD burner don't let you do it? Here we will provide useful tips to help you solve the problem. How to Solve iDVD Can't Burn MOV files? Because MOV files are native to Mac computers, Windows users would have to do one of these two things to process MOV files: first, download the necessary codecs or second, install a third-party media player. MOV files are easily playable by QuickTime. If you don’t have it installed in your computer, you will find it hard to play MOV files. And it is a different story if the user would want to edit these files as well. While MOV can easily be manipulated by the Apple’s Final Cut Pro X, that software can be a little too expensive for a regular home computer user. There’s just a handful of video editing software that can handle MOV files, and not all of them are offered for free.